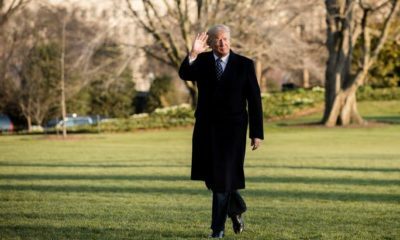 WASHINGTON, January 16, 2019 — President Donald Trump’s second consecutive attempt to publicly drive a wedge between House Speaker Nancy Pelosi’s leadership team and rank-and-file Democrats was as ineffective as the first. Although seven Democratic members of the House’s moderately-minded Problem Solver’s Caucus joined their Republican colleagues in a White House Situation Room meeting with the president, they made clear that their presence would in no way indicate a willingness to allow Donald Trump to dictate terms on border security funding while the longest-ever partial government shutdown in American history continues. 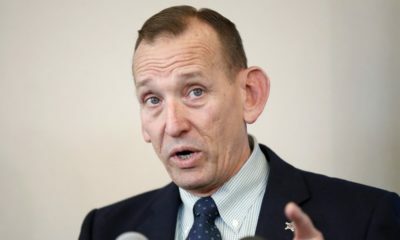 In a statement, the seven House Democrats — New York Reps. Anthony Brindisi, Thomas Suozzi and Max Rose, Freshman Reps. Dean Phillips, D-Minn. and Abigail Spanberger, D-Va., second-term Rep. Vincente Gonzales, D-Texas and caucus co-chair Rep. Josh Gottheimer, D-N.J. made clear that ending the nearly-month-long government shutdown is a necessary precondition for a successful negotiation on border security. “Over the last weeks, we have been listening to our constituents and speaking with our fellow Members of Congress — in both parties and in both chambers. There is strong agreement across the aisle and around the country: We must reopen the government” they said in a statement. The Problem Solver’s Caucus members suggested that there is bipartisan agreement that reopening the government would provide the possibility of both parties coming together to fix some of the country’s toughest problems. The message those seven Democrats conveyed to the president also seemed to put an end to the tactic he’s employed in his quest to force Democrats to accept blame for the shutdown, which is almost 26 days old. 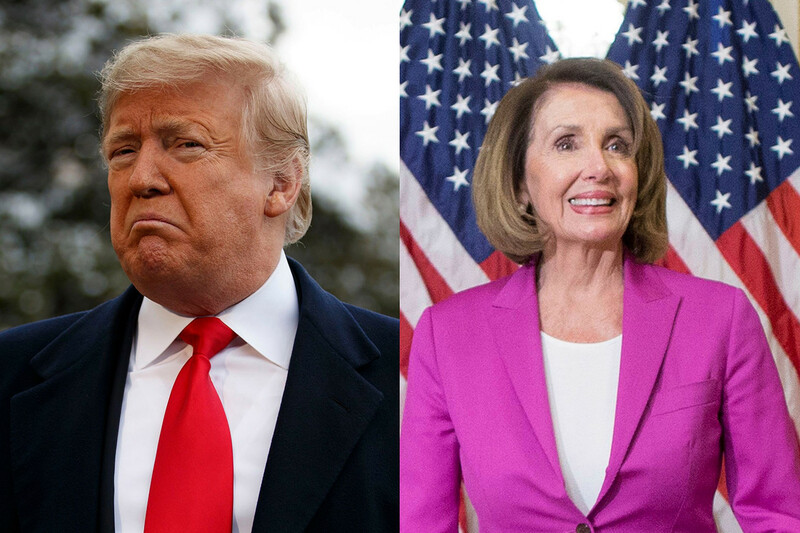 For the second time in as many days, moderate-minded members refused to put themselves between Trump and House Democrats. White House officials had been attempting to portray Pelosi and other Democratic leaders as out of touch with the rank-and-file of their caucus. There appeared to be little rhyme or reason to who received invitations apart from some members of the Blue Dog Caucus, a group of moderate Democrats who mostly reside in so-called “red” states. However, not one of those who were invited took the president up on his invitation. 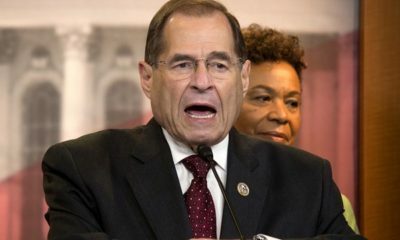 One member of House Democratic leadership said the White House’s futile pursuit of Democratic allies reveals how badly the president has miscalculated. Raskin told BeltwayBreakfast he has “no idea” why Trump continues to focus on House Democrats when the Senate has yet to take up any of the GOP-authored appropriations bills the House has passed in recent days. Those pieces of legislation, which members of the upper chamber had approved unanimously, were authored as part of a compromise which the president upended after criticism from right-wing talk radio host Rush Limbaugh and anti-immigration commentator Ann Coulter. “No one is going to budge in terms of demanding the reopening of the government. 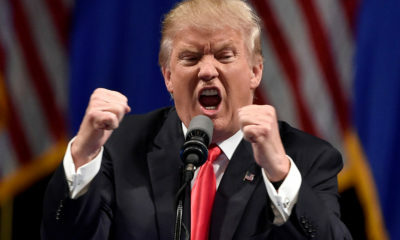 Either the president does not understand the political dynamics of the situation, or this is a comical effort to distract attention from [Senate Majority Leader] Mitch McConnell and the Republicans in the Senate who could reopen the government today” Raskin said. The second-term Progressive Caucus member said that many of his GOP colleagues are dismayed over the president’s stubbornness, and are despairing of the political consequences yet to come if the shutdown continues. “They want to see the whole thing go away,” Raskin said, predicting that if Senate Republicans begin to break away from McConnell and vote to reopen the government, enough of their House counterparts would join with Democrats that a veto of any funding bill could be easily overridden. WASHINGTON, December 20, 2018 — House Republicans are hoping a $5 billion border security package will avert a partial government shutdown by satisfying President Trump’s desire for a border wall he can show his supporters. As of Thursday evening, House Republican leadership was in the process of approving rules under which the House will debate a bill to fund the government through the end of this fiscal year. While the House had been prepared to debate a four-month continuing resolution to avoid a government shutdown over the Christmas holiday, lawmakers are now preparing to debate an omnibus appropriations package that includes $5 billion for the border wall which has been a centerpiece of Donald Trump’s immigration policy since the earliest days of his candidacy. It remains to be seen, however, whether enough House Republicans will vote for this new funding bill to garner a majority. Republicans’ effort is complicated by the fact that many lawmakers have already left Washington for the Christmas holiday, with some defeated and retired House members leaving Washington for good. But even if this latest effort to secure funding for a border wall is successful, such a proposal is likely to meet stiff opposition in the Senate, where nine Democrats will need to give their assent to send the bill to the president’s desk. Meanwhile, 800,000 federal employees began preparing to spend Christmas on unpaid furlough in the event the two chambers cannot agree on a bill that Trump will sign. At the Office of Personnel Management, Acting Director Margaret Weichert sent an email to all employees Thursday morning to prepare them for the possibility of a partial government shutdown. “Prudent management requires the proper preparation for all contingencies, including the possibility that a lapse could occur. To prepare for this possibility, we are working to update our contingency plans for executing an orderly shutdown of activities that would be affected …by a lapse in appropriations,” Weichert wrote. “Thank you for your hard work, dedication, and patience throughout this process, and for all that you do for the OPM and the American people. 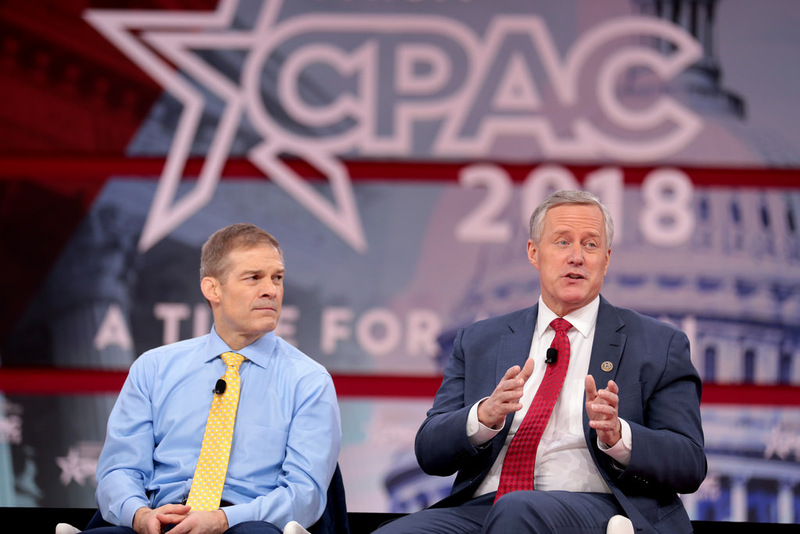 On Capitol Hill, House Freedom Caucus member Mark Meadows told reporters that the public servants who’d be out of work or working without pay absent a funding deal knew what they were getting into when they entered federal service. “It’s actually part of what you do when you sign up for any public service position,” Meadows said. 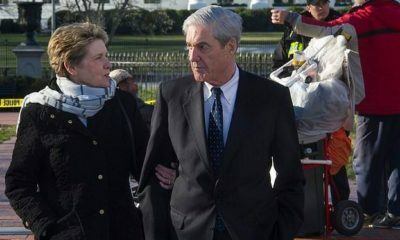 Meanwhile, White House officials told BeltwayBreakfast that the president still planned to leave for his Christmas vacation at his Mar-a-Lago estate as planned. WASHINGTON, December 13, 2018 – House Minority Leader Nancy Pelosi’s Wednesday agreement to limit herself to no more than four more years at the helm of congressional Democrats may assuage objections to her assuming the speakership, at least from the left flank of the party. Leaders of the Congressional Progressive Caucus said Tuesday that Pelosi’s ability to win the vote to become House Speaker in January 3 is all but assured, said Rep. Mark Pocan, D-Wisconsin, and Rep. Pramila Jayapal, D-Washington, the caucus co-chairs. They said, however, that they expect that Pelosi to honor her commitment to ensure that Progressive Caucus members are allocated 40 percent of the seats on congressional committees. “We are ready to do the work of real, accountable democratic reform,” said Pocan, who has been caucus co-chair since 2017. The other co-chair, Arizona Democrat Raul Grijalva, is retiring at the end of this year, and Jayapal is stepping into his spot. With the large incoming freshman class of Democrats elected in 2018, the ranks of caucus are expected to swell to about 90 in the session that begins on January 3, 2019. The caucus was formed in 1991 by Rep. Bernie Sanders, then an independent congressman from Vermont. Sanders, now a senator, is the caucus’ only member from the upper chamber. When will there be fresh blood in top Democratic leadership? While some progressives might hope for fresh leadership, Pocan said that members on “planet earth” acknowledged the reality that three veteran lawmakers will be the principal leaders of the Democratic Caucus: Pelosi, age 78; Maryland’s Steny Hoyer as Majority Leader, age 79; and South Carolina’s James Clyburn as Majority Whip, age 78. 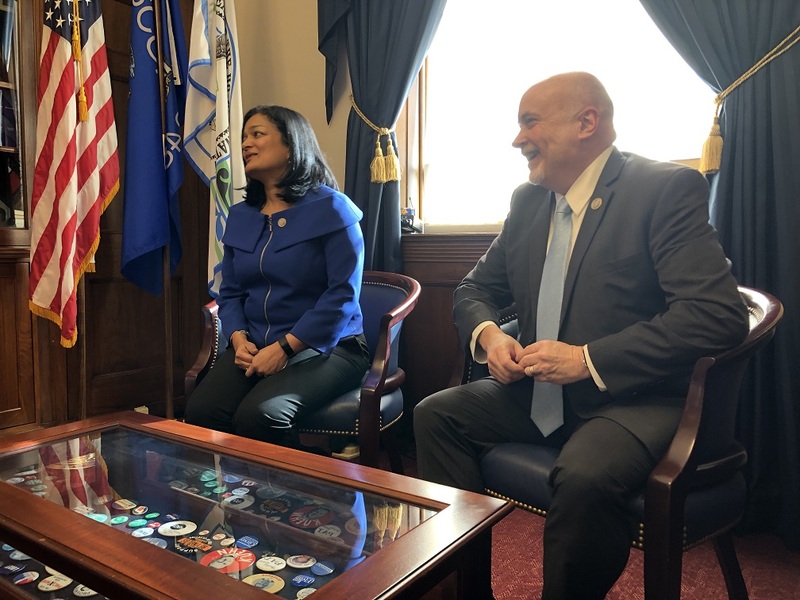 The sit-down with Pocan and Jayapal took place on Tuesday, before Pelosi’s deal with several members of the Democratic Caucus to limit herself to three terms as speaker. The deal also includes the option of a fourth term if the leaders could obtain support from two-thirds of the Democratic caucus. The compromise agreement, announced on Wednesday, would also apply Hoyer and Clyburn and well as Pelosi. As each had served in those posts from 2007-2011, when Democrats last held the majority in the House. Wednesday’s agreement four-term agreement (including time already served) would signal an anticipated departure from those leadership roles by the end of 2022. Pocan and Jayapal lauded Pelosi’s skills at negotiation, which were visible after a highly contention public discussion in the Oval Office between her, Sen. Minority Leader Chuck Schumer, and President Donald Trump. The flare-up centered on Congress’ willingness to fund the border wall proposed by Trump. The meeting had happened just before the sit-down, and Jayapal said that Pelosi was “damned good” at negotiating. They said Pelosi’s skills and passion will serve Democrats well on hot-button issues like immigration, as well as areas where there might be greater agreement between Democrats and the White House. Those issues include infrastructure spending and regulating, or jawboning down, the price of prescription drugs. “She has a deep sense of the immorality of what the president is doing on the wall, and his political scapegoating of immigrants with the caravan,” said Jayapal. Jayapal is an Indian-American immigrant who is a member of the House Judiciary Committee. She had just come from her committee’s hearing with its sweeping cross-examination of Google CEO Sundar Pichai, who is also an Indian immigrant. At the hearing, Jayapal made mention of her own ethnic background, as being born in the same Indian state as Pichai. 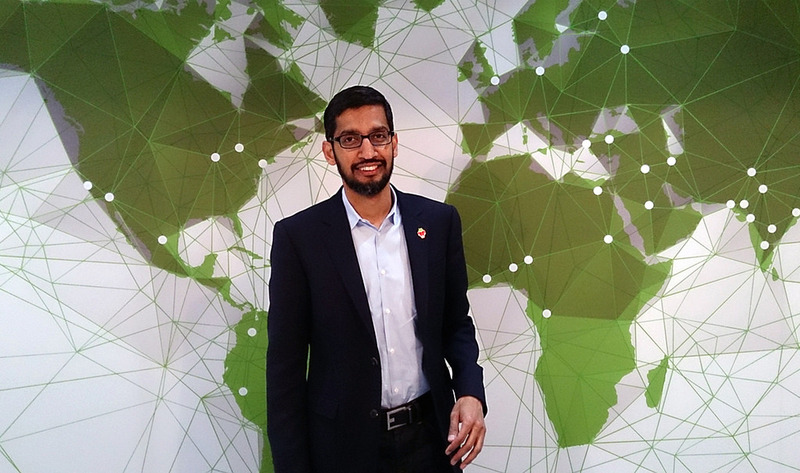 Pichai did not make any reaction to Jayapal’s comment. Pocan highlighted what he saw as the Democrats’ three-fold priorities for the upcoming session: Access to health care, infrastructure investment and increasing wages, and countering the culture of corruption from the Trump administration. He said progressives were particularly enthusiastic about infrastructure investment, and predicted that a $1 trillion infrastructure investment would prevail from the House, as “there is vast support” for that sum. That’s only half of what the progressive caucus has called for. But even the progressive caucus’ preference for $2 trillion doesn’t match the $4 trillion-$6 trillion that the American Society of Civil Engineers has said would be necessary to properly rebuild America’s infrastructure, said Pocan. Photo of Google CEO Sundar Pichai by Maurizio Pesce used with permission. WASHINGTON, December 10, 2018 — When Google CEO Sundar Pichai raises his right hand before the House Judiciary Committee Tuesday morning, it’s possible the ensuing hearing will be a sober and judicious look into his company’s data collection practices. But Pichai is far more likely to become the latest punching bag for House members – of both parties – eager to perpetuate the unproven claims that technology companies are acting to systematically censor conservatives. Both House and Senate committees have convened hearings on social media companies’ practices over the past year. The hearings haven’t resulted in any bombshell revelations or explosive testimony. But Republicans’ accusations of censorship – or at least tilting the scales in search engine results – have been a constant drumbeat from members of Congress and witnesses. “I can’t speak for my colleagues on the other side of the aisle, but this appears to me to be part of an effort to rile up their base, that is anti-intellectual, anti-technology, and anti ‘elite,’ by saying that those fancy-pants in Silicon Valley are trying to keep them from hearing our message,” said Lofgren. “For a group that is in charge of the entire government, they do a lot of whining as victims,” she said. 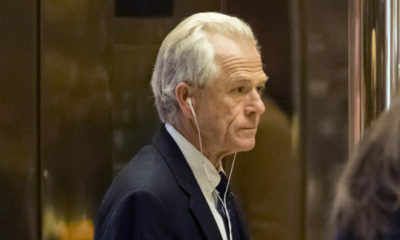 “A lot of the [previous] hearings have turned into a free-for-all where everybody complains about perceived or real transgressions by social media companies against different political persuasions, and the Republicans have specialized in that,” Raskin said. Is the enforcement of internet companies terms of service ‘censorship’? Raskin said that some conservatives are confusing technology companies’ enforcement of their terms of service with censorship because of an overlap between what some consider conservative values and what many people consider hate speech. President Trump’s defense of the white nationalists who participated in the August 2017 Unite the Right rally is responsible for blurring the lines between conservatives and the white nationalists who count themselves as part of Trump’s base, Raskin said. “If you have the equivalent of a Charlottesville march online, and Facebook or Twitter doesn’t want to host it, you have to find somewhere else to conduct your internet hate rally,” he added. But based on the experience of one previous hearing, Raskin hopes that there is room for agreement on both sides of the aisle to have a serious conversation and not get hijacked by partisan bickering. The dual issues of how regulators should treat technology companies, and how technology companies treat conservatives caught the attention of President Donald Trump in late August, when he threatened three of the largest technology and social media companies in the United States for allegedly working to censor conservatives, despite offering no verifiable evidence that any such censorship is taking place. “I think Google is really taking advantage of a lot of people, and I think that’s a very serious thing and a very serious charge. I think what Google and others are doing, if you look at what’s going on at Twitter, what’s going on on Facebook, they better be careful because you can’t do that to people, you can’t do it,” Trump said during an August 28 Oval Office meeting with FIFA President Gianni Infantino. “I think that Google and Twitter and Facebook are really treading on very very troubled territory and they have to be careful, it’s not fair to large portions of the population,” said Trump. Trump’s remarks came on the same day that National Economic Council Director Larry Kudlow told reporters that the administration was “looking into” Google’s operations. Though BroadbandBreakfast inquired as to the result of whatever investigation may have been conducted — and whether Trump still thinks Google is “taking advantage of a lot of people” — a White House spokesperson had not yet responded by our deadline.